Finding realistic prices for a standard staircase replacement doesn’t have to be tough. We have assembled the key information and guidance on stair costs, right down to the installation. First of all, there is a set of specific building regulations regarding staircases. These guidelines cover a range of technical specifications, ensuring both safety and comfort for homeowners. It covers shapes and dimensions: height, level, pitch and length. Clearances must also be taken into account, right down to the smaller details such as handrails and balustrades. If you’re fitting a similar replacement staircase, you’re unlikely to encounter problems as the dimensions should be very similar. For new additions to a building, such as loft conversions or extensions, you are making a significant change to the building. You will need to ensure your designs abide by the set regulations. – The minimum depth of step should be 220mm. Measurement taken from nosing to nosing of the next step. – The height of each step should lie between 190mm and 220mm. – The standard recommended width of a staircase is 850mm, but this is not compulsory. – The headroom on the landing should be at least 200mm or 190mm for loft conversions. – The pitch of a flight of stairs should not be too steep (exceeding 42°). Full details of the UK building regulations for staircases is also available online. If you’re working with professional tradesmen or architects, they should already be working to these guidelines. With new additions or significant changes to staircase design, you must contact your local building authority. They will need to come to review the work, then sign it off. Expect to pay £200 for this service if you’re doing the work yourself. If you’re unsure about this process seek advice from your local building authority, help is freely available over the phone. When calculating the cost of a new staircase, the chosen design and material will be the most significant factors. – Radical bespoke designs can rocket up to £25,000! As you can see, the sky really is the limit when staircase prices are concerned. But coming back down to earth, see below for a list of the average staircase costs with different designs and materials. The prices shown are ballpark figures for a good quality staircase. *VAT needs to be placed on top, delivery will cost extra. Square posts, spindles, and flat newel caps come as standard. Installation costs can rise depending on the ease of access, lower levels are usually much cheaper than higher levels. Complexity and scale also needs to be taken into consideration. Typically a carpenter will install an average staircase within a few days, so expect to pay £200-£400+. Large savings can be had if you are confident enough to install the staircase yourself. Keep in mind the difficulty of the job without experience, it takes patience and a little muscle. Let’s say you want the entire job completed by professionals, measuring, building, installing, even removal and disposal of your old staircase. An average price for replacing a staircase in this case would be £2000 – £4000. By ordering stairs yourself and then having a carpenter fit them, you could save £500+. How Long Will a Stair Replacement Take? If you are planning on installing a bespoke design staircase you need to have accurate plans draw up by an architect. This process can take up to 10 weeks. The actual manufacture of the staircase may take a further 2-4 weeks. In most cases, a basic made-to-measure staircase only requires measurements from floor to floor. Yourself or professional tradesmen easily take these. Once you have confirmed your specification with a supplier, they will produce a replacement staircase within a week. It will take a carpenter around two days to fit a new staircase. More time should be allowed when removing an existing staircase too. You must consider access during this time; you may not be able to access the second floor! Expect a lot of dust and general disturbance during both the removal and installation stages. If you are considering fitting replacement stairs, you can seek valuable advice from the British Woodworking Federation. Also, remember to contact your local building authority before starting the job! 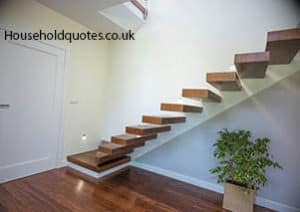 Get FREE Staircase Quotes Today!